Every knight needs a good helmet, sword and shield, and we've got lots of idea to make your own here! Doesn't Sam look fierce in this wonderful knight's helmet? It's straightforward to make using simple supplies, but an adult will need to help with the stapling and sticking! 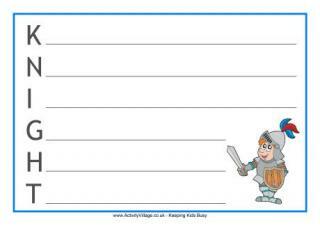 No knight would be ready for battle without a shield, and kids can enjoy creating their own coat of arms or making a simple knight's shield using the ideas below. Here are instructions for making a knight's sword for your outfit. It is simple to make a knight's tabard for your knight's costume, and your child can help in the design. This shield is simple to make from corrugated cardboard and some paint. We printed out our coat of arms (see the link suggestion below) but you could also paint your design straight onto the shield.